Over the holidays, I have attended a few potluck parties. When it comes to bringing the appropriate food, it is always a bit tricky. It must be a dish that can withstand time (not everyone will arrive at the party on time), ability to keep warm and hopefully not require any heating up (not every house has an oven or an available stove) and most importantly easy to transport from your home to the host’s house. Potato dauphinois is one dish that fits all the three requirements. It is essentially potato and cream with a hint of garlic. Seriously what’s not to love about potato and cream? This French dish is not terribly difficult to prepare and the ingredients are very easy to obtain. 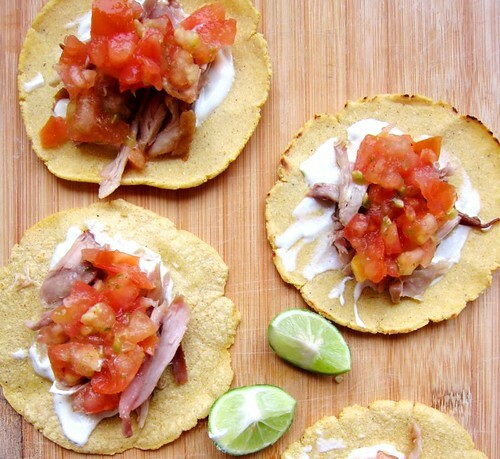 In addition, this dish can feed around 10 people as starter. It is also a great complement to any meat or fish dishes. Besides being a starter, you can also prepare potato dauphinois as a meal, serving it with salad. If you like, you can add in protein to give it a bit more substance. However I don’t think this dish needs any cheese as the cream provides sufficient richness. I am not very particular about the choice of potatoes – waxy (the potatoes will hope their shape, giving the dish a bite) vs. floury (the potatoes break down easily so you get a creamier gratin). In Singapore, the potatoes are not labelled but most of them are floury. If you like your potatoes to hold their shapes, cut down the cooking time in the pot. - Prep the potatoes – peel (with a vegetable peeler) and slice them into 3mm-thickness. I like to use the mandolin for this as you will get a consistent result. If you do not have a mandolin, I would strongly urge you to get one. If not, take your time to slice the potatoes. Similar thickness will ensure even cooking. - In a large pot, pour in the milk, thickened cream, salt, nutmeg and mustard and give it a quick stir. Add in the sliced potatoes in the liquid mixture and put the pot on a stove and let it simmer for 10 minutes. If you like your potatoes to hold their shapes, you can cut down the cooking time to 7 minutes. In addition, if I am bringing this dish to a party, I tend to add in a bit more milk to prevent the potatoes from drying out during transportation and while sitting on the dining table. - While the potatoes are cooking (you can leave them alone to cook, there is no need to stir them; just make sure the cream don’t boil over. ), preheat the oven to 200oC. - Using the cut side of the halved garlic, rub it around the inside of the baking dish. With the knob of unsalted butter, grease the inside of the baking dish. You can use any baking dish that will fit 1kg of potatoes and 600ml of liquid. - After the potatoes are cooked, place the potatoes and cream mixture in the baking tray. At this stage, I will pick the slices that are not broken and set aside. These pieces will be used to decorate the top of the dish. - Once the potatoes are placed evenly in the dish, you can put the picked slices of potatoes on top of the dish. It is not necessary for you to do this – I just like to present a pretty dish. 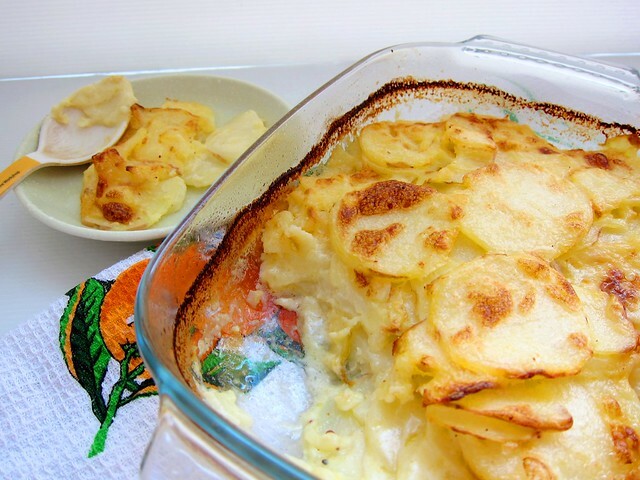 - Bake the gratin for 35-40 minutes or until golden and bubbling. Be careful not to overcook as the cream will curdle. Once again, if you plan to bring this dish to a party, under-bake it (around 25 minutes) – the residual heat will cook the dish. 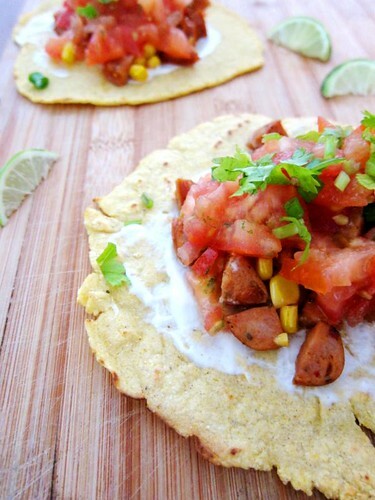 - Serve hot with a sprinkle of chopped parsley or dill. I have been wanting to make gougeres for the longest time. I have this phobia of making choux pastry, fearing my roux would burn, the mixture becoming lumpy and so on. Since I was in the “French” mood, I brave up and attempted to make some gougeres. Oh man, gougeres were so easy to make. My roux didn’t burn and everything was taken care by the mixer. The only tedious work that need to be done was grating of cheese. And silly me who got so scared about gougeres. The wonderful thing about making gougeres is that you can prepare extra and freeze them, and bake them when needed. Dorie Greenspan’s version uses Gruyere cheese which is salty and delicious. You can also use other cheeses like Cheddar, Parmesan, Comte and so on. I like gougeres when they are fresh out of the oven – they are crispy on the outside and chewy in the middle. I brought them to my friends’ office and served as breakfast – they actually don’t mind them at room temperature. Still, I think they are best consumed while warm. - Preheat the oven to 220oC. Line two baking sheets with silicon baking sheets or parchment paper. - Add the milk, water, butter and salt in a saucepan and place it on the stove (At this stage, you should also standby your wooden spoon). Over high heat, bring the mixture to a rapid boil. 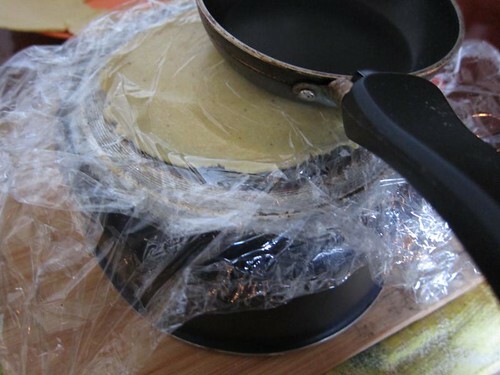 - Add the flour all at once and reduce the heat to medium low. With your wooden spoon, quickly stir the mixture. A dough will be formed and a light crust might develop. Just keep stirring vigorously for 1-2 minutes to dry out the dough. You should end up with a smooth dough. - Remove the pot from the heat and place the dough in the bowl of a stand mixer fitted with paddle attachment (you can also use a hand mixer. If you are using a wooden spoon, you need to work fast). - Let the dough sit for a minute – I would usually turn the mixer on a low speed and spin the dough a couple of rounds to release the heat. - On medium speed, slowly add the eggs one by one until everything is incorporated and the dough is thick and shiny. If the dough separates while you are adding the egg, do not panic. Everything will come together when the last egg is added. - Once all the eggs are added, you can beat in the grated cheese and season with a pinch of black pepper (if you are doing so). - The dough needs to be spooned out immediately. 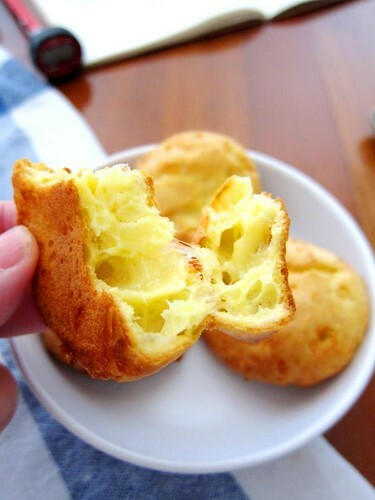 - I like to use an ice cream scoop (about 1 tablespoon size) to spoon the dough – this way I will get even-sized gougeres and I don’t have to worry about the dough sticking onto the spoon. If you do not have an ice cream scoop, you can use 2 spoons – one to scoop the dough and the other to push and drop the dough. Drop the dough onto the baking sheet, leaving about 2 inches of space in between. - If you do not wish to bake all the gougeres, once you have spooned the dough onto the baking sheet, put the sheet in the freezer. Once frozen, you should be able to lift the gougeres off the sheet easily and pack them in ziplock****. - Place the baking sheets in the oven and immediately drop the temperature to 190oC. Bake for 12 minutes, rotate the baking sheets, from front to back and top to bottom. Continue baking until the gougeres turned golden brown and formed a crust. They should also puff up at this stage. This will take about 12-15 minutes. - Once the gougeres are done, you can serve them immediately. If not, transfer them to rack to cool. They are best eaten on the day you made them. *The size of the egg is quite important for this recipe. Do not use those extra large eggs – too much egg will cause the gougeres to collapse. If you want, you can actually measure the amount of egg as stated above (A large egg is around 56g without shell). **In Singapore, not every supermarket stocks Gruyere cheese. If you spotted Gruyere cheese, make sure it is AOC certified – you would be able to see the Le Gruyere Switzerland branding on the cheese rind. ***Beside black pepper, you can even try out freshly grated nutmeg, chilli flakes and so on. 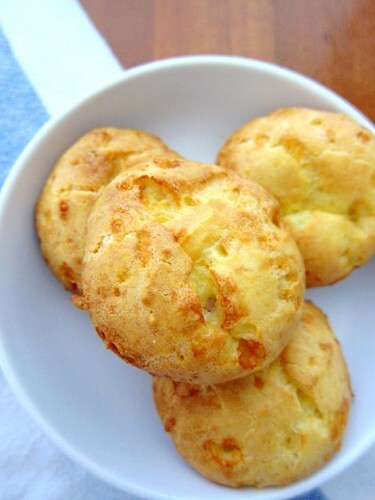 ****You can bake the frozen gougeres straight from the freezer (no need to defrost). You might just need to bake about 1-2 minutes longer. Recently I had this insane craving for asparagus. Perhaps it was all the tweets about spring time and the abundance of asparagus. Or maybe it was all these recipes on this gorgeous vegetable. 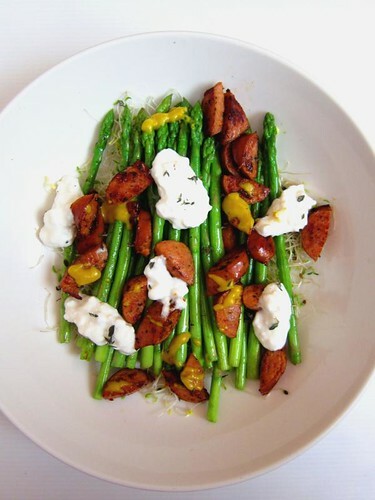 Asparagus is one of the easiest vegetables to cook and there is almost no prep work needed. All you need to do is trim or snap off the woody ends and they are ready to be cooked. Before I start to cook asparagus, I like to blanch them in boiling water for 30 seconds. This process turns them into a brighter green. For lunch, I pan-fried some homemade chorizo. While the sausage was almost done, I threw in the (blanched) asparagus for a quick stir-fry. In this way, the asparagus will be coated with some of the oil from the chorizo. To serve, I placed some alfalfa sprouts on the plate, topped it with the asparagus and chorizo. I finished off with spoonful of cottage cheese and a bit of Colman’s English mustard. If I had crème fraiche in my fridge, I would mix it with a bit of mustard, Worcestershire sauce and lemon juice, and you get this sharp and creamy dressing. 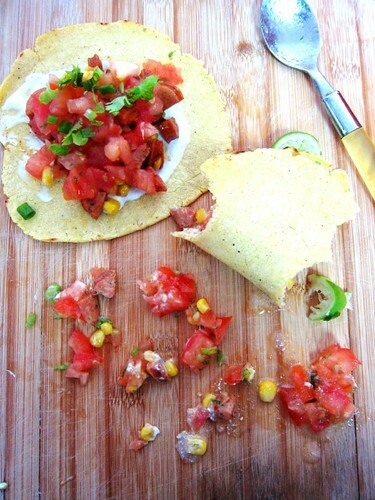 This lunch is quick and easy to prepare and great on a bloody hot day. I rarely like female host for cooking shows. However recently I made an exception for Rachel Khoo. I started watching The Little Paris Kitchen: Cooking with Rachel Khoo a couple of weeks ago and got addicted to the show. Now, I want to cook all things French. The concept of The Little Paris Kitchen is to demystify and simplify French cooking. What I really like about the show is Rachel used a few quality ingredients and managed to whip up all these delicious looking dishes in her tiny (and almost non-existence) kitchen. That is a pretty amazing feat. There are a few recipes that I wanted to try. So baby steps – I chose to make oeuf en cocotte (egg in a pot). Yes, yes I am not a fan of eggs. But when mixed with other ingredients which helped to mask the “yolky” taste, that is when I will eat eggs. 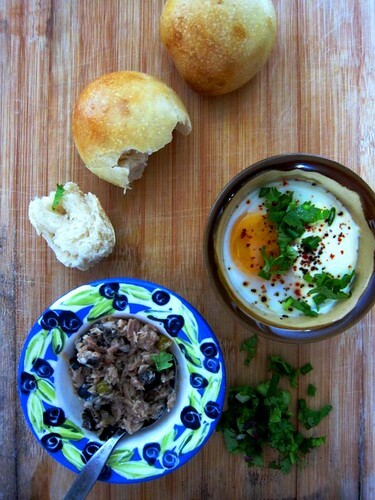 Oeuf en cocotte is a really simple dish to make. And it is also a recipe that is (almost) impossible to mess up. The best part about this dish is that you can even use any leftover in your fridge – that little knob of sausage, the half cut bell peppers – and put them in that little pot with crème fraiche and egg. In my case, I kept my oeuf en cocotte simple – in my ramekin (sidetrack: I bought these awesome vintage T.G. Green ramekins long ago, so I was super duper happy that I can use them in this recipe), I only put in crème fraiche, egg and some seasoning. To serve, I had it with tuna mixed with this wonderful jar of Waitrose Puttanesca Mix(which has olives, capers and anchovies) and homemade buns. You can have it as afternoon tea or like me, had it for breakfast. 3) Seasoning – salt and black pepper. In my case, I also used my favourite Korean chilli powder. 4) Herbs – Rachel’s original recipe calls for dills. As I don’t have that readily available, I used parsley and spring onion. - Put 1 tablespoon of crème fraiche at the bottom of a ramekin. Season it accordingly. The original recipe calls for salt, black pepper and freshly grated nutmeg. In my case, instead of the nutmeg, I used Korean chilli powder. - If you want to add in any vegetables or sausages, you will need to cook them first and add in after the dollop of crème fraiche is placed at the bottom of ramekin. You might not need to season the crème fraiche if you have seasoned your vegetables/ sausages. - Crack an egg on top. If you are not a confident “egg cracker”, you can crack the egg in a separate bowl and put it on top of the seasoned crème fraiche. - Put the last tablespoon of crème fraiche on top and season accordingly. - Place the ramekin in a baking dish and pour enough lukewarm water into the dish to come halfway up the sides of the ramekin. This will ensure the content in the pot cooks evenly. 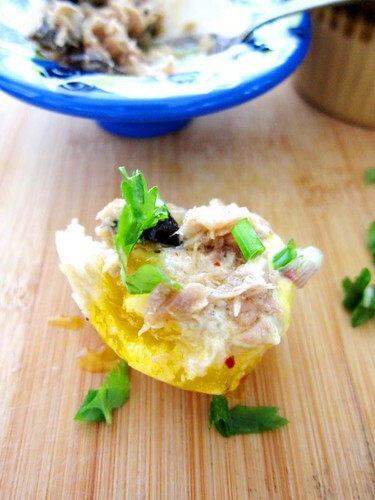 - Bake for around 15 – 18 minutes depending on how you like your egg. - To finish, sprinkle some herbs on top. You can use parsley, dills, or even thyme. - This dish is best eaten warm with crusty baguette or good bread rolls.